I didn't post about my experiences with Whole30 on day one. Why? Because I was in bed with a horrible headache. I barely finished the work day, went home, whipped up a quick bite to eat and went to bed. I suspect the lack of coffee being responsible for it. I mean, it can't be a "carb flu", because I haven't been eating grains or sugar for months. I have been drinking buckets of coffee lately. It's now day 2, and I still have a headache. Not as bad as yesterday, but I can tell you, I will be going to bed early again. The fact that I feel this lousy tells me that it's probably not so bad that I lay off the caffeine for a while. I always thought I wasn't addicted to the stuff, but now I think I am. And if it weren't for the fact that I don't like coffee without sweetener, I would still be drinking it. Even doing Whole30! For dinner today, I made this salad of some leftover veg. It was really nice. 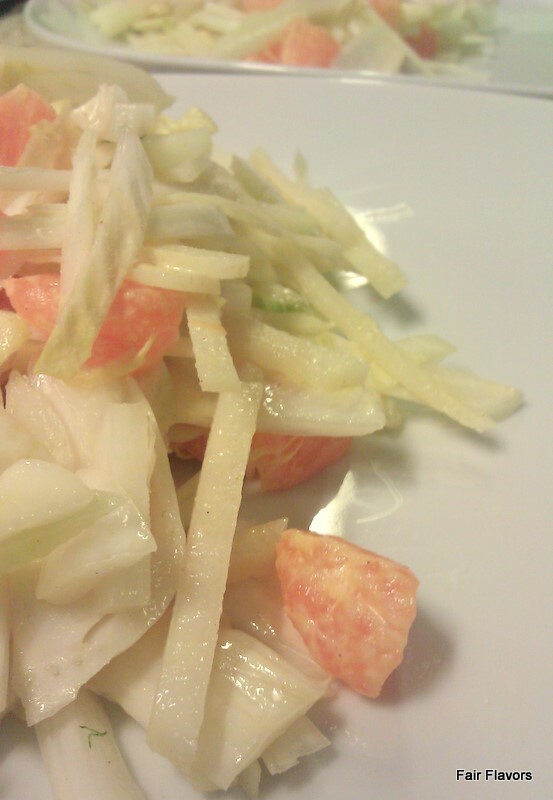 I chopped third parts of Belgian endive, kohlrabi and cucumber. I made some paleo mayonnaise (without sweetener) earlier this weekend and mixed some with a little mustard and a little curry powder. Then mixed the vegetables with the dressing and threw in a good hand of tangerine parts cut into pieces. With it, we ate a good steak. All in all, I'm okay now, but I can't say "I'm full of energy and feeling awesome". Oh well...probably at the end of the week. Maybe it has to be worse before it gets better...right?